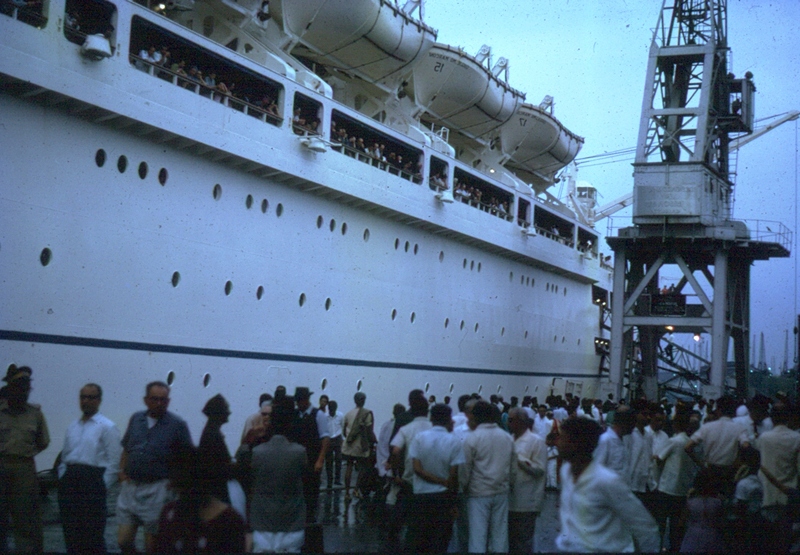 August 6, 1965 we were on our way to Port Adelaide, Australia to join the Italian passenger liner Marconi for our first overseas adventure. There was an air of excitement mingled with apprehension as we negotiated the swaying gangplank with our carry on luggage. Down in the bowels of the ship were our earthly possessions, a modest collection of furnishings and household bits and pieces. We’d been married only eight short months and hadn’t yet had a chance to accumulate the trappings of a settled married household. To us the Marconi was a huge and impressive ship, and it was obvious to everyone international travel was a new experience for me. Georgine had one up on me there as her family had been one of those who’d migrated to Australia from Germany in 1949. As children on that voyage they’d faithfully attended meal time during the long journey through Suez Canal and onward over the Indian Ocean when most adults were confined to their bunks with acute sea sickness. She nearly fell overboard at the Red Sea looking for Pharaoh’s drowned army of the Exodus. I could see her looking for signs leading to the dining room as we headed for our cabin to offload carry on luggage. We were soon back on deck as a crowd of well-wishes, most of them young adults, were there to see us off. I thought it was a nice gesture, but one of my closest friends later wrote they were there to see we didn’t change our minds. They wanted us exported! Well I assume he was just kiddin! Anyway, it was fun pelting them with the usual ticker tape as the liner moved away from its dock at precisely 9 pm. We were really on the way! Our hasty trip over the Great Australian Bight which offers a cheeky smile to the South Pole was a bit of an eye popper. I want you to imagine what it would be like to sit on the hump of a galloping dromedary negotiating a series of downward hairpin bends. At times as we looked unhappily out of our cabin porthole we were treated to a gaggle of marine life making us their private TV show. The waves were enormous, and the passage rough in spite of stabilizers. But that negative experience passed as we entered more tranquil waters of the Indian Ocean, and made a beeline through the Indonesian archipelago to our first destination, Singapore. Looking at those Indonesian islands in the moonlight from our vantage position on the ocean is one of those visions we’ll never forget. Beautiful is an inadequate word to describe that part of the world. For someone raised in a little country town in Australia, Singapore was another of those unforgettable experiences. We didn’t realize at the time twenty years after this first entry we’d spend ten happy years working in that City State. Singapore in those days had the same steamy smell of any tropical city. Five years later when we passed through on our way to Australia on holidays that great statesman, Lee Kwan Yu had cleaned up his country to be outstandingly clean and inviting. We’d made our first entry at a historic moment. On the day of our arrival Singapore had declared independence from Malaysia, but as they hadn’t come to terms with their new identity Immigration placed a Malaysian entry stamp in our passports. Standing ominously in the channel separating Indonesia from Singapore was a segment of the British navy, sent to protect the new state from expansionist aspirations of President Sukarno of Indonesia. We were met by a resident expatriate scheduled to show us around Singapore and commenced our tour to the clash of cymbals and drums and the imposing Lion Dance. The word Singapore shows the influence of Sanskrit on this area in ancient history, and means Lion Place. From Singapore we made our way west along the channel separating Sumatra from the Malaysian peninsula and entered the Bay of Bengal. We’d been scheduled to make a stop at Colombo in what was then known as Ceylon, but because we’d been delayed by an unscheduled medical rescue it was decided to proceed directly to Bombay. In Singapore we’d picked up a royal guest. A Maharaja and his women had boarded the ship, and we watched in awe as he made the waiters his personal attendants for the remaining part of the journey to India. Every serving was examined minutely, and with a clap of his hands he’d summon his new attendants to point out any minor flaw in the food offering and send it back to the kitchen to be replaced. This was an Italian ship, so announcements were in Italian, with a follow up in Ital-English. We really had no problem until near the end of the journey when the Purser’s Office decided to recheck our passports before we disembarked in Bombay. We heard the announcement Mr. and Mrs. Grikio wanted at the Passaporto Office. Somehow that went right over our heads, until an anxious posse of Pursers tracked us down and inquired why we were not answering their call. 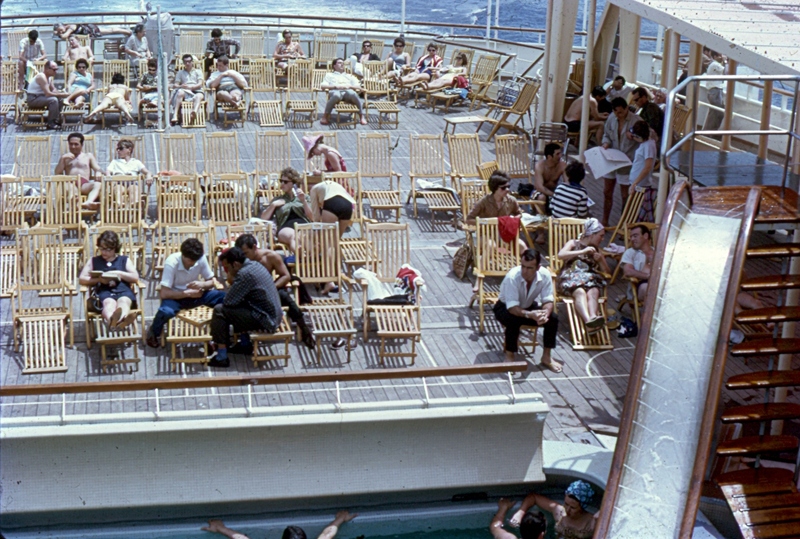 They probably imagined we’d jumped overboard. There is something awe inspiring about the Indian coastline. On the horizon you can see the hills that run down the backbone of India, but it’s only in this part of the world you see fishermen in flimsy boats that look like they’d capsize in moderate weather miles out at sea, slim figures manipulating their tiny sails and nets in order to plumb the depths of the sea and thus ensure their family survival for one more day. In actual fact these frail looking craft are quite sturdy and seaworthy. The sea changes from blue green to brown far out from shore. It was monsoon time when we arrived at Bombay August 19, 1965, and as we were towed slowly into the docks to the accompaniment of a misty rain we could see those massive iron grates separating the outside world from the docks, with hands and faces of countless souls pressed against them. This was Bharat Mata! Our clearing agents waited with us as we impatiently counted the hours until formalities were completed and our earthly possessions emerged from their hiding place in the hold. One of our cases didn’t quite make the usual gentle descent and bounced its way to a halt on the wharf. We were reminded of that event for the next five years as we contemplated our oval washing machine on wash days. We’d arrived at our new home, and looked forward to adjusting to our adopted culture. Sweet Ian, I do believe you have had some of the most interesting and exciting experiences of anyone I know. I have never been aboard any kind of ship and really have had no desire to be on one. I don’t even do well with little boats and would much rather have myself on dry land. It’s funny how you just accept the things that happen in your life as if they were meant to happen. It takes a comment like yours for me to reflect how lucky I was to have had the experiences I write about. Thank you for your comment.